Few people see travel for what it really is – a rather stressful situation. International travel expert Anya Clowers explains – when people are traveling, they are out of their familiar routine, eating unhealthy food, missing sleep and messing with their pooping patterns. Sure, people often travel in order to have fun, but that doesn’t change the fact that travel puts people’s bodies out of balance, and that affects them in unpleasant ways. For kids, the situation is compounded by the fact that they don’t understand what is going on or what is expected of them. And crabby kids make the entire travel worse for everyone involved. 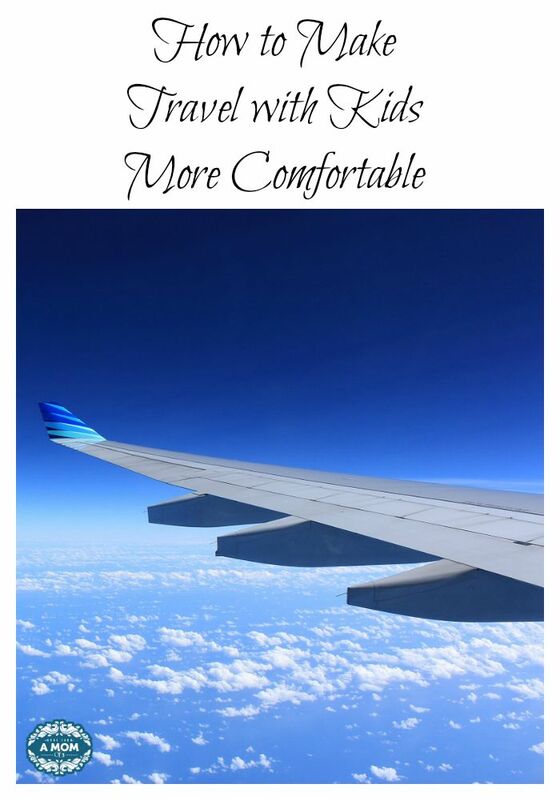 While you can’t control the length of the trip or the temperature inside the airplane, you can take steps to make sure that the kids are as comfortable as can be. And that right there is a huge step towards enjoying your travel. Here are a few things to keep in mind when you travel with kids. Physical comfort – If you’re traveling by car, make sure you have sun shades for the windows to prevent it from getting too hot in the back. Also make sure that the kids are comfortable in their car seats. When traveling by plane, you can take along your car seat if your child is really comfortable in it. However, many parents prefer an airplane travel harness as it gives kids more freedom and is also easier to carry around. Another important item is the travel pillow. Sleeping while sitting is quite uncomfortable, especially when your head is slumped to the side. You can keep your kids’ head in place by using a booster seat headrest or a good travel pillow such as Amiba Monsters. If you’re expecting cold temperatures, carry a light jacket along so that you can easily put it on or take it off as and when required. A light blanket may also be in order. Food – No matter how short your travel, always have water on hand. Juices and snacks are never a bad idea either, and they are essential if you’re traveling for longer periods. Take empty straw cups that you can fill with juice or water as required. You can also consider juice boxes – either the use-and-throw or spill proof kinds. As for snacks, it is tempting to give your kids goodies that will keep them happy during the travel. However, feeding the kids too much sugar is never a good idea, especially when you need them to sit still for hours together. Carry healthy yet yummy snacks for the journey. Clothes – Have an entire set of clothes on hand for every child that is traveling. If there’s a baby on board, then have an extra set for the adults as well. This will come in handy when you have bathroom accidents, spills, travel sickness, or any other unexpected mess. You certainly do not want to arrive at your destination sticky, smelly and feeling horrible. Also keep empty plastic covers on hand to keep soiled clothes in. Entertainment – This is a must for travel of all kinds. If your children have a few favorite mobile games that you are sure they will not tire of during your trip, great. If not, download a few fun and educational mobile games for them the morning of your travel. The novelty of these games will (hopefully) last long enough to keep them entertained through your trip. Also consider handheld video games, coloring books and activity books that your kids are bound to enjoy. Seasoned travellers recommend buying the kids a good pair of headphones so they can listen to their favorite songs or watch movies without disturbing fellow travellers. Even if you’re only planning to use the in-flight entertainment system, the headphones you buy will be a lot more comfortable than the ones the airlines provide. Preventing fights – Bickering kids = stressed parents. Bickering kids confined in a car/plane = harried parents. Keep fights to a minimum with these invaluable tips: Pack identical snacks for each child, sealed in individual re-sealable plastic bags. This also means individual straw cups or juice boxes. If the kids are going to be coloring, pack one small box of crayons for each child instead of having them share from a single box. If you cannot provide the same tablet or console to each child, have a schedule that specifies who plays what for how long. (Hint: Each child gets an equal number of seconds with each device.) When traveling by car, it makes sense to have a seat schedule as well – specify who sits in which seat for how long. And yes, you most certainly stop by the roadside and allow the kids to switch seats when the specified time period is up. In fact, you can even use the opportunity to take the kids on a small walk or make them do a few jumping jacks so that everyone gets back in the car in a better mood. Seating – When flying with a baby, see if you can get a bassinet seat. Not only does it give you a place to keep your baby, it also offers more leg room. If there aren’t any babies or you can’t have the bassinet seat, ask for the seats right at the back – it’s closer to the bathrooms and the flight crew. It is also less crowded. If your baby is under 2 and you can’t have the bassinet seat, you can either bring a car seat (the airplane travel harness won’t work here) or keep the baby on your lap. For many parents, the thought when you travel with kids is enough to make them rethink their vacation. However, you can just follow these tips to make sure that your travel is pleasant for you, your fellow travelers and even your kids!